STREAMLINING business process to make them investor friendly, Bohol Micro, Small and Medium Enterprise Development (MSMED) Council has accomplished with a partner the forging of agreements in trainings for eight towns here, a highlight in the first Bohol MSME Xperience held at the Island City Mall, Thursday, November 27, 2008. Early surveys pointed out that cumbersome business processes here have become turn-offs for investors wanting to sow capital in the country. Cumbersome process here comes in lengthy registration and in unreasonable licensing steps. These have been identified as major discouraging factors of investors’ while the country loses capital that could have been important in perking up local economies. Here, Bohol tapped the support of the German Development Foundation (GTZ) through its Small and Medium Enterprise Development for Sustainable Enterprise Promotion (GTZ-SMEDSEP) program. Now 8 towns have undergone two training workshop modules, sources at the Department of Trade and Industry (DTI) pointed out. The GTZ, in their belief in the promise of putting up the needed vigor in small and medium enterprises in the countryside would jumpstart local developments has been kind enough to fund the pioneering activity, DTI said. 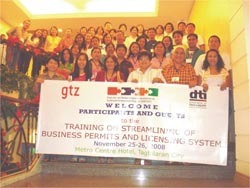 The training workshops on Business Process and Licensing System attempts to simplify the seemingly endless paperwork needed before one investor can establish his business in the place, DTI said. The towns of Jagna, Talibon, Ubay, Tubigon, Antequera, Balilihan, Cortes, Maribojoc have passed the first workshop on November 14-16, the source added. Moreover, the same towns have also done the second workshop last Tuesday and Thursday, all to the goal of making the crucial business registration processes streamlined to cut red-tape and straighten the bureaucratic snags. The development also forms part of the report during the highlights and accomplishments reported by the SMED Council. That same day, DTI regional Director Asteria Caberte presented the winners of the Pambansang Pamilihan after an extensive search for Bohol’s most customer friendly public and private markets. At the gathering in Tagbilaran City’s biggest Mall, HNU Consumer Group was also presented and the event also featured a talk show billed as Pagpalambo sa atong negosyo. The show host Blair Panong elicited business tips from Bohol’s major entrepreneurs including JJ’s food and restaurant chain great Jun Caturza, farmer entrepreneur Nador Tadena who is the province’s leading supplier of Japonica rice variety, Arnold Labunog of Jojie's Bakeshop fame, Frank Montero of the Alona Tropical Resort, Mayor Roberto Salinas for the Abatan River Development Management Council and Aster Caberte for the DTI-Regional Office. The day’s activity also included a press conference aired live over local radio stations under the Bohol Tri-Media Association. Moreover, the day also featured a financing forum where four financing institutions presented their programs for SMEs. Another highlight was speed networking, a venue for business matching among entrepreneurs and marketing contacts.